His words were often open to an ironical interpretation, and one could not always make sure whether he was speaking seriously or, as the pithy slang phrase has it, "through his hat." Winslow Homer's "sense of the dramatic," his feeling for grave and often tragic situations, has made him a titanic figure in the history of American painting. His work, which, from the 1890s on, revolves around the themes of man versus nature and life versus death, has inspired some of the most nuanced argumentation on nineteenth-century American painting. In Inventing the Modern Artist: Art and Culture in the Gilded Age (1996), for example, Sarah Burns investigates how Homer's paintings of men at sea spoke to American businessmen riding the perilous wave of an unpredictable stock market and purchasing Homer's paintings as heroic testaments to their own manly struggles. Elizabeth Johns, in her biography Winslow Homer: The Nature of Observation (2002), accounts for the grave scenarios of Homer's imagery by turning the focus from the patrons to the artist himself. She sees Homer's artistic production as a form of spiritual self-reflection. He was an "observer" in a period when "observation meant using God's gifts of mind in the most reverent way," that is, "to study and draw conclusions about a world in ongoing creation." This chapter moves in another direction. Taking a cue from two of Homer's earlier biographers, William Howe Downes and Philip C. Beam, I reconsider the central importance of the "gag" to Homer's dramatic sensibility. If Homer was engaged in a spiritual quest, if his art spoke to embattled Gilded Age manhood, how did he arrive at a painterly idiom that encapsulated such heady concerns? He cultivated a reputation for seriousness only after attempting to bring the gags of his illustrated work to oil painting, a medium he first explored in the early 1860s, during the American Civil War. To stress this should not diminish his stature but rather add nuance to our understanding of his complex art. For Homer during these years created an entrée to the New York art world by way of visual deadpan, which resonated with the methods of the period's controversial platform comedians and answered the critics' call for a "higher sort of humor," different from the antebellum comic mode that one critic derisively dubbed the "funny school of the fifties." If much of that pre-Civil War work can be described as "semantic prattle," an art that signposts and almost compulsively restates to convey its meaning, Homer's paintings offer no easy punch lines. In Homer the joke is "told gravely," to borrow a phrase Mark Twain uses in explaining the mechanics of verbal deadpan. Indeed, Homer's paintings withhold the conspiratorial wink and nudge, framing jokes in understated, even ambiguous terms. 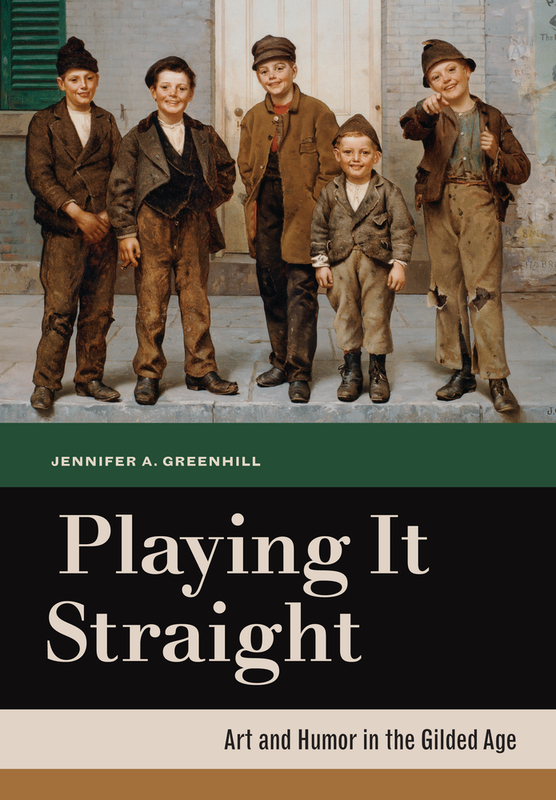 Playing It Straight: Art and Humor in the Gilded Age offers a stunning new look at late-nineteenth-century American art, and demonstrates the profound role humor played in determining the course of culture in the Gilded Age. 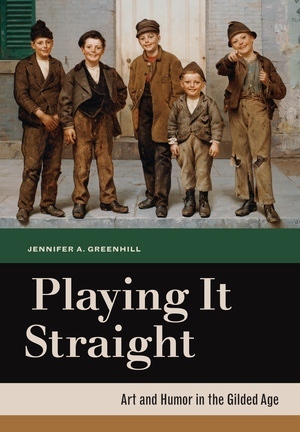 By showing how complex humorous strategies such as deadpan and burlesque operate in a range of media—from painting and sculpture to chromolithography and architectural schemes—Greenhill examines how ambitious artists like Winslow Homer and Augustus Saint-Gaudens rethought the place of humor in their work and devised strategies to both conform to and slyly undermine developing senses of “serious” culture. Exhibiting an awareness of the emerging requirements of serious art but maintaining an investment in humor, they played it straight. Jennifer Greenhill is Assistant Professor of Art History at the University of Illinois, Urbana-Champaign. Her publications have appeared in Elective Affinities, Art History, and American Art. She has received research grants for Playing It Straight from the American Council of Learned Societies, the Luce Foundation, the Wyeth Foundation, the Smithsonian, and the National Endowment for the Humanities.